Oh my.... the horn heroes are back at the Mill with a truckload of trombones, saxophones, trumpets, tubas and a bass clarinet! As well as all this brass there's the golden tonsils of Tim Stewart and the pyrotechnics of Finn Scholes electric piano playing, not to mention his outstanding skill on the vibraphone, a spectacular and arcane instrument from the past that sounds like the future. But let's not forget the boots. They're huge! They stomp! The boys parp and sing while you dance! 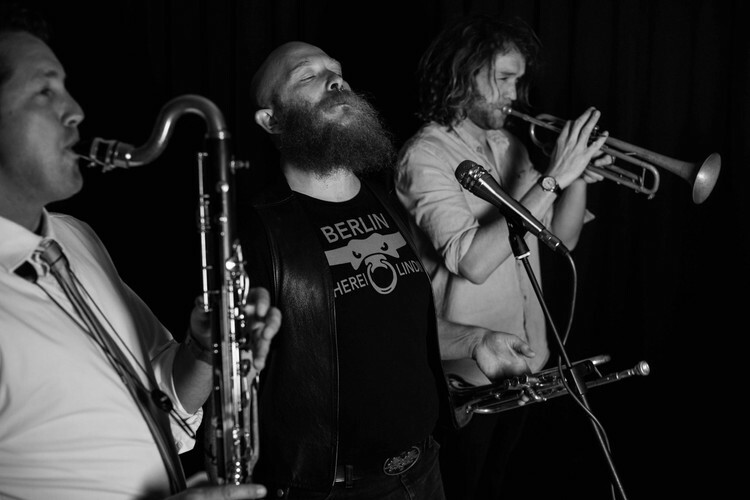 This outstanding trio of musicians play songs from three different Hopetoun Brown albums as well as journeys into the Carnivorous Plant Society setlist and a smattering of classics. You'll be entertained by muscular multi-instrumentalism and rhythmic pulsing harmony. Not to be missed!